Perfect menswear looks! Love the mix of patterns! Love the tie with this suit! He is charming and so elegant in that outfit. The only thing that reminds me of this century is the concealed cell phone! The blue shirt is a good contrast to the tweed. Classic. This is sublime tailoring right here. I love the pattern mixing he did and the bead chain is a nice extra something. Love the striped shirt and the tie! Great! Yeah, the blue stripes and paisley go boom! Very cool jacket and tie! At a quick glance this man looks like a farmer or countryman, but a second look shows the detail of the tailoring; the cuff buttons, wide lapels and the cut of the jacket show that he is a fashion victim rather than a man at a shooting party. Nice style. Is this the guy from what not to wear? I love it because my head says that the fabric for the vest and the jacket should be reversed. Only it isn’t! Fashion brain training–learning to see things new ways. Gotta love it! Love the contrast stitching on the button holes and that beaded chain. Dapper indeed. He’s a dapper looking chap. Oh my god. Dapper personified. I love the plaid coat & hat. It looks a little “tight ” on him ~not sure. Pattern, texture, color and fit….all spot on. This is how I was taught to dress. He totally nailed it! 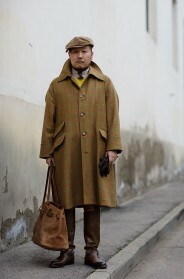 It is difficult to put tweeds together, but he did it. Unless he meant it to be that way, which I would find restrictive and uncomfortable, I think the jacket looks too small and the waistcoat too tight. Otherwise the combinations of colours and mix of patterns is beautiful and classic. 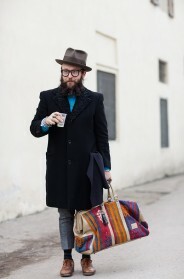 Perfect style, one can almost feel the wool! I think thats one of my favorite guy looks. He looks like he could be a great detective. Very slick. Great combination but everything a little larger might have been better. Button missing from jacket cuff. I think it’s just unbuttoned. Those look like working button holes. How to stand out and be contemporary without wearing some stupid capelike garment. I love it all, historically aware yet fresh as. Hope he keeps it all for his sons and grandsons. I’m sure I’ve seen the same man, wearing the same suit, but with a burgundy cardigan instead of the odd jacket. 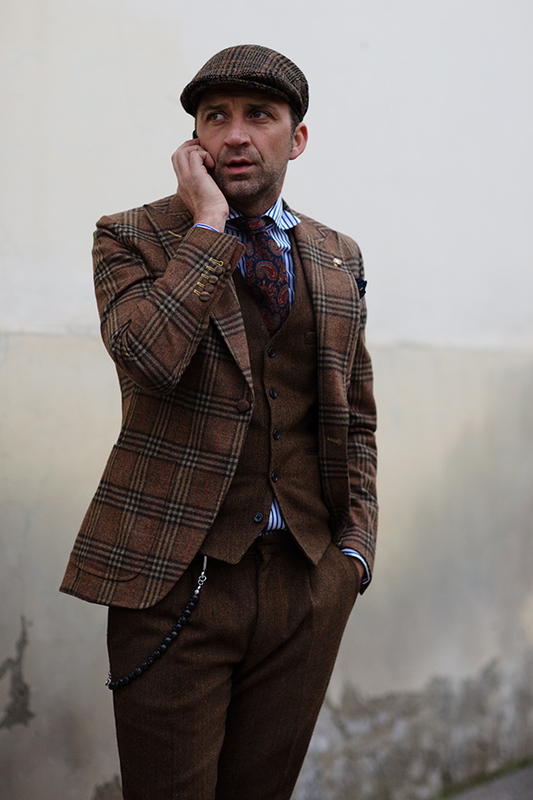 Which, is exactly what I would do if I had such great pieces, but no matching suit jacket. The outfit is too tight, and not in a good way. This guy looks incredible and I can’t work out quite why – I think it is because he’s is comfortable in his look and these particular clothes. Whatever it is, he’s rocking it! This man DOES look good! When I see pictures like this I always wonder how I might look like in a similar outfit. Often I am not quite sure, if it is me or my style. But people can change (yes, in a double sens of the word).